Are you planning to cover your pool with a special cover? That is a great choice. Putting a cover over a swimming pool ensures that dirt does not get a grip on the otherwise beautiful and inviting water. However, if you want to cover your pool, it is also always important to have a suitable roll-up system. A pool roll-up system is not immediately purchased by many people who have just invested in a swimming pool because they fear that buying them will be accompanied by a hefty cost. We can, however, reassure you. If you choose to order a swimming pool roll-up system here at Dekzeilenshop.nl you opt for a practical, durable, qualitative and very interesting system that will undoubtedly add value to your pool! It goes without saying that one pool roll-up system is not the other. In order to ensure that everyone's expectations can be met, we have opted to include various roll-up systems in our range. You are here at Dekzeilenshop.nl therefore at the right address for a so-called Roll-up Eco 2,5m - 4,5m but what else to think of a Roll-up Allround as well as a Roll-Up Deluxe? The Deluxe version is suitable for both bubble wrap and foam covers with a width of 3.5 - 6.5 meters. 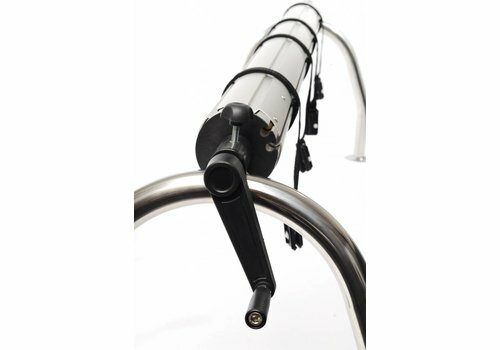 Moreover, by buying this pool roll-up system you can count on three different supports, namely fixed, mobile with 2 pneumatic tires or mobile with 4 stainless steel swivel wheels. 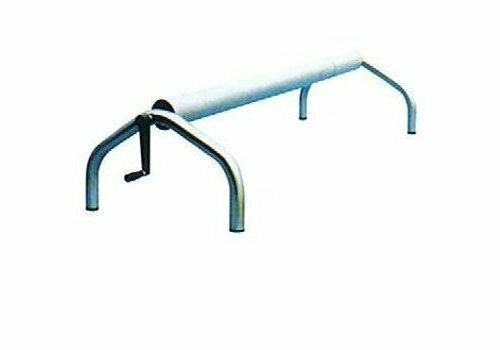 In other words, whatever requirements you attach to the swimming pool roll-up system that you wish to purchase, it belongs here at Dekzeilenshop.nl all possibilities! Today, of course, there are various possibilities on the market to lay a cover over your pool. Yet many people are still a big fan of the classic, manual roll-up system. The reason for this is obvious. In the first instance, such a system is obviously much more advantageous compared to the automatic variant. In addition, it also adds that they are extremely durable and consequently almost impossible to break. Are you looking for a swimming pool roll-up system that you will certainly enjoy for a long period of time? Then we can only recommend you to opt for a manual swimming pool roll-up system. Order your swimming pool roll-up system today! Did the above convince you of the many interesting advantages of buying a manual swimming pool roll-up system? Do you also want to have it for your swimming pool? That is possible! Here at Dekzeilenshop.nl our customers always have the possibility to choose between different possibilities. And we make it possible to offer you such a roll-up system at the best price possible. Add to that the fact that all roll-up systems are also delivered completely free and fast (in the Netherlands and Belgium) and you do not need more reasons to choose to also order your swimming pool roll-up system here at Dekzeilenshop.nl!